The National Directorate For Fire and Emergency Management at the Department of the Environment received no reports of major episodes of flooding over the weekend. Met Éireann has advised that the current threat of stormy weather from Wednesday onwards remains in place and the rainfall will serve to top up the already near capacity of many rivers and this still poses a major risk. This risk remains heightened in slow-moving rivers and particularly the Shannon. The Barrow, Nore, Suir Slaney, Lee and Blackwater are also at very high levels and any additional rain can cause serious flooding. Meanwhile, Irish Farmers Association (IFA) president Eddie Downey visited farms along the River Shannon at the weekend to survey the damage caused by heavy rains and flooding in recent weeks. He said the situation was critical for farmers along many of the main rivers with livestock, winter crops and some farm yards and family homes under threat from flood waters. 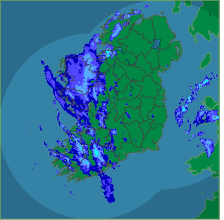 Pictured: The latest rainfall across Ireland from Met Eireann at 9am.